Lord Adonis, who quit as chair of Theresa May's infrastructure commission in December. Arch Remainer Lord Andrew Adonis will be the speaker at the 382nd Cutlers’ Feast in Sheffield. 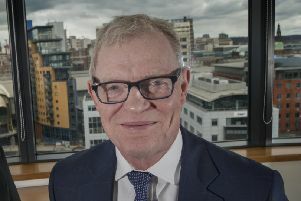 The former chair of the National Infrastructure Commission - and Labour education and then transport minister - will appear at the event at the Cutlers’ Hall on May 17. It is the 382nd occasion on which it has been held. In recent times he has variously tormented vice chancellors over ‘excessive’ pay - a campaign which led to the resignation of Bath University VC Glynis Breakwell - BBC presenters over bias and Brexiteers over everything. His appearance follows business secretaries Sajid Javid and Greg Clark in the last two years. Lord Adonis is seen as being free to speak out compared to serving cabinet ministers. The ‘white tie’ Cutlers’ Feast is billed as the most important business dinner outside London.